Giveaway alert! 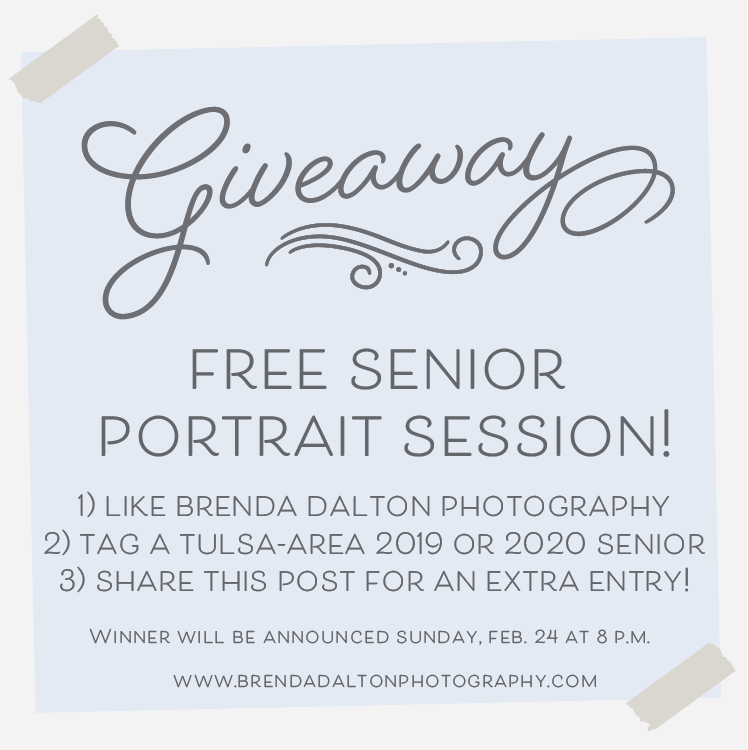 In celebration of the relaunch of Brenda Dalton Photography, we’re giving away a FREE senior portrait session to THREE deserving Tulsa-area seniors! Know someone who is a 2019 or 2020 senior in Sand Springs, Berryhill, Mannford, Owasso, Broken Arrow or other surrounding areas? Make their day by nominating them for a free portrait session on our Facebook page! WHAT: A high school senior portrait session and $50 print credit (The Mini Experience at a $450 value!). Learn more about our senior sessions here! HOW: Like Brenda Dalton Photography on Facebook and tag one person in our giveaway post who would l-o-v-e to win a free senior photo session. Gain additional entries for each person you tag in this post. Get an extra entry for following us on Instagram, too! Winners will be announced SUNDAY, FEB. 24 at 8 P.M. on Facebook, so keep an eye out! Giveaway is not endorsed, sponsored or affiliated with Facebook or Instagram in any way. Void where prohibited. Prize cannot be redeemed for cash. Winners will receive a custom mini portrait session to be redeemed during the month of March 2019 and must meet on-location for session within the Tulsa metro area. Location will be decided between Brenda Dalton Photography and winner. Winners must sign a contract and model release. Winners images may be used in Brenda Dalton Photography marketing material and portfolio online and in print.